Walking a 4 inch beam, 50 feet in the air is no easy task. Below a level of conscious awareness, the brain is constantly responding “emotionally” to the world. Before we are even aware of feeling afraid, for example, physical responses have already begun: pounding heart, sweaty palms, tense muscles. The physical sensations in turn tell us what we are feeling. This is yet another aspect of physical intelligence, or communication with our organism. Such reactions have their roots in human evolution, but may not be completely adapted to the lives most of us lead. 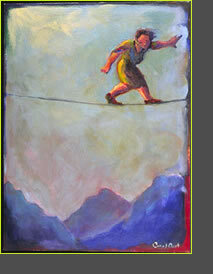 A fear of heights and performance anxiety are more obvious “outside” threats. However, we can experience poor perceptual orientation or being off balance, as “danger,” creating muscle tension and restriction that greatly affects how we live our body. As experienced in previous classes, we can learn to become aware of such automatic/autonomic processes. In this class we will experiment with situations that bring these responses into awareness. Our effort will be to understand both their affect, and how we can better work with such powerful influences. Walking a 4 inch beam, 50 feet in the air, among other ropes course activities.